Sacred Heart Church's new Parish Hall is being built by Pacific Crest Construction, and has made considerable progress since excavation commenced last summer. The three-story building is situated just north of the Rectory, where Sacred Heart School once stood in the Brooklyn neighborhood. The architectural design of the proposed hall can be seen on a poster showing the finished structure, posted on the barrier fencing along S.E. 11th Avenue. Following the initial excavation, builders quickly framed the structure and added walls and flooring. 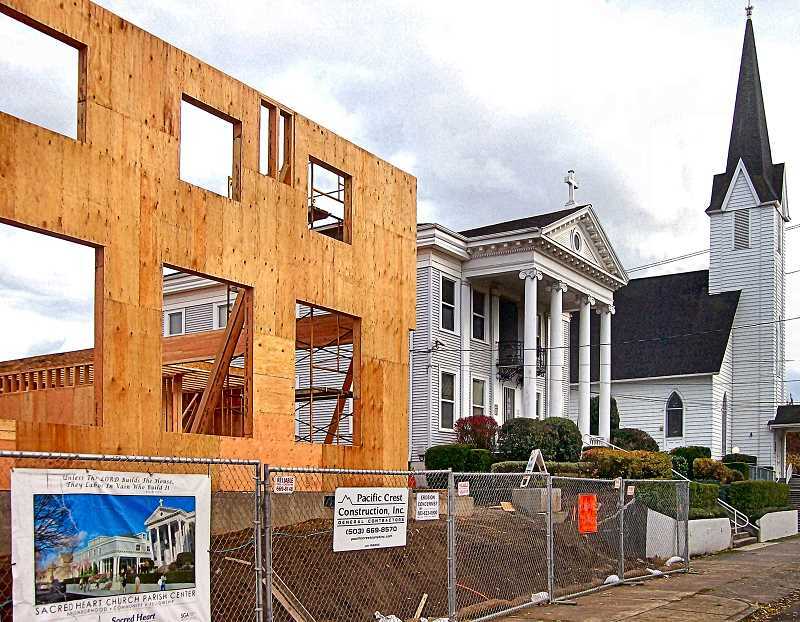 The building will feature the same Gothic design elements as the adjacent Church and Rectory. The new Hall will have ADA access and a kitchen, and will be able to seat up to 250 people for a meal. Additional parking is planned on the East side of the hall. According to Building Design Committee member Darryl Phillippi, construction is pretty much on schedule, with trusses set in December to protect workers on the interior. Fencing and temporary plywood doors have been installed for safety, and to keep onlookers from entering the work site. The new Parish Hall is expected to be completed by next June.